Following our previous post related to Elafonisi beach, we present to you the famous Balos beach! 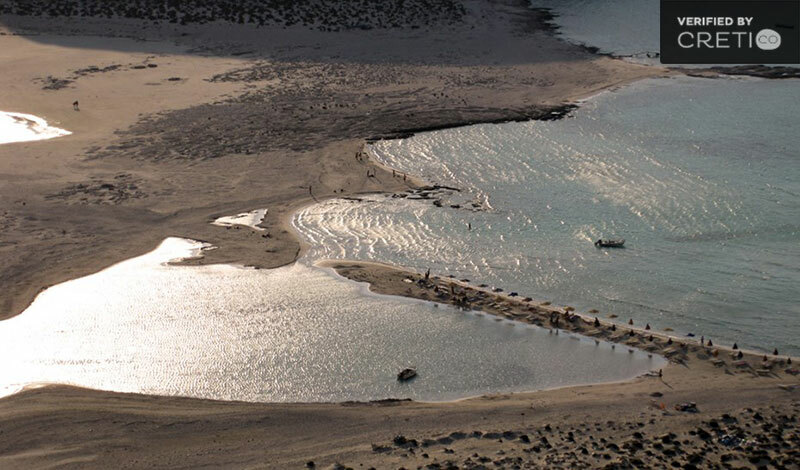 The famous lagoon of Balos beach is located approximately 56km west of Chania, Crete, and 17km northwest of Kissamos. It is a sandy beach lying between the cape of Gramvousa and the smaller cape called “Tigani”. 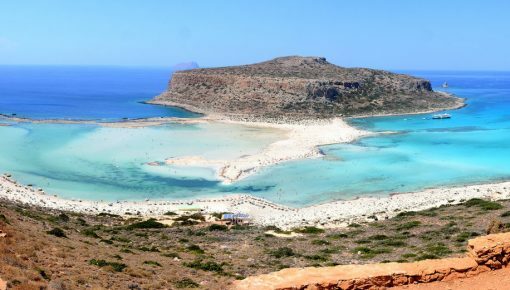 Balos beach has been photographed more than any other beach in Crete, and is one of the places you should visit during your Crete holidays. Indeed, it is no coincidence that even Charles and Diana had come here with their private yacht several years ago. Balos beach is famous for its turquoise waters, the wild natural beauty and the wonderful exotic scenery it offers. In summer, the beach is flooded daily by thousands of visitors who arrive mostly by boat from Kissamos. If you do not like crowds, then you better not come to the beach in July and August. Also, the perfect idea is to get to the beach in the morning, before the boats arrive from Kissamos. The few hours of solitude in such a heavenly place will remain etched in your memory forever. The main disadvantage of the lagoon is that the bottom is a bit muddy and the shallow waters are responsible for the growth of microorganisms, which sometimes cause an unpleasant smell. Also, the locals say that the currents of the sea carry to Balos rubbish or tar. The main disadvantage of the lagoon is that the bottom is a bit muddy and the shallow waters are responsible for the growth of microorganisms, which sometimes cause an unpleasant smell. 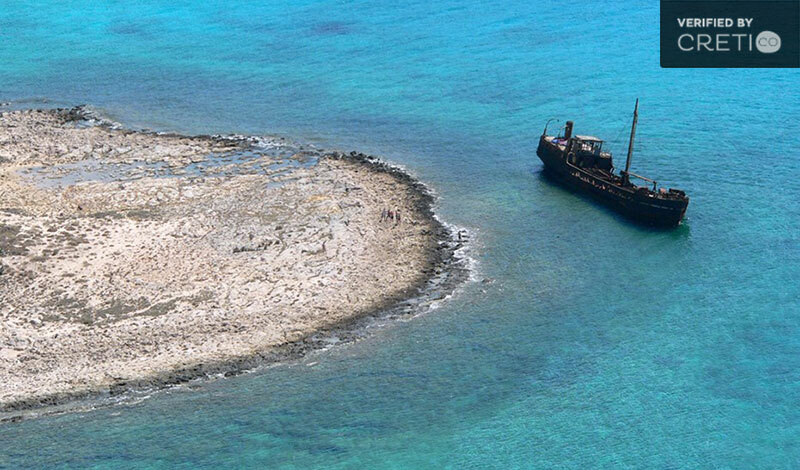 Also, the locals say that the currents of the sea carry to Balos rubbish or tar. You are able to reach Balos beach in three ways. The first and easiest is to get the morning boat from Kissamos. 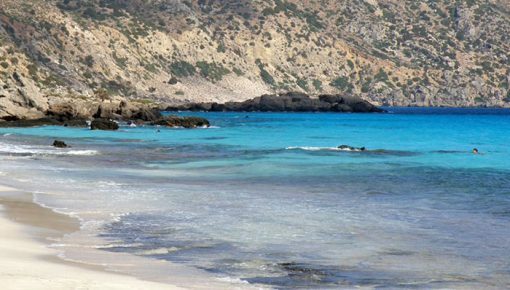 You will have the chance to admire the wild shores of Gramvousa and the boat will leave you for a dip in the exotic beach of the island of Gramvousa, where you will see the old fort and the wreck. If you are lucky, you may be accompanied by dolphins. If you don’t want to take the boat and you have a tall car or a motor bike, you can ride the dirt road that starts from Kaliviani along the cape of Gramvoussa. After 10km, at the end of the road, you’re over the lagoon. 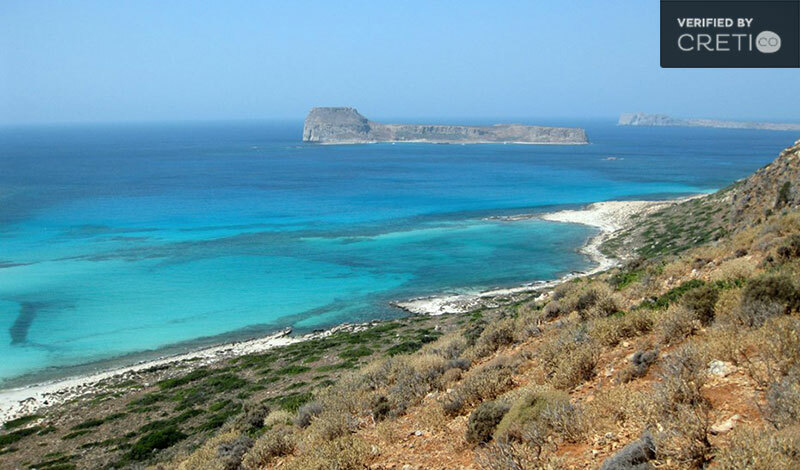 The panoramic view of Balos and the island of Gramvousa is breathtaking. From there starts a 1km long stone path leading to the beach (10′-20 ‘) or, better, in paradise! 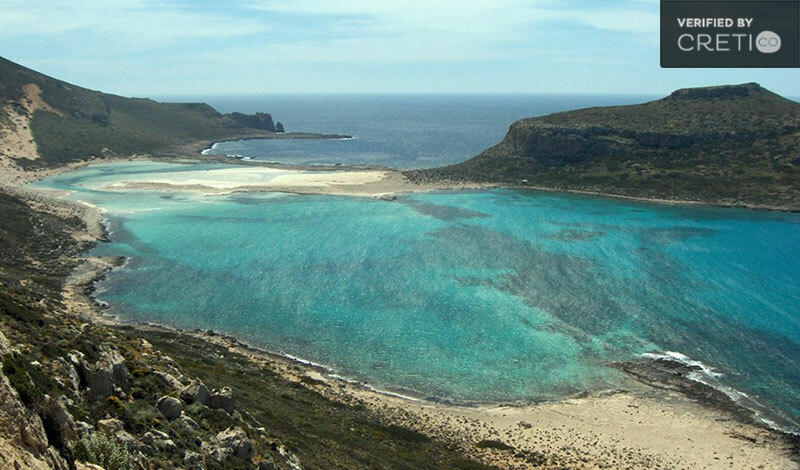 However, the most exciting way to reach Balos beach, is to walk three hours from Kaliviani, in the wild and dry landscape of Gramvousa. Do not forget to wear a hat and carry water. You can visit the picturesque church of St. George, which is located in the cape “Tigani”. It is also worth a visit to the large cave where many women and children were tragically killed when they tried to hide there from the Turks. The Turks discovered the hiding place randomly and slaughtered all Christians. Today there is a commemorative plaque in the place where the bones of the victims were found. The feast of all Saints is the Memorial Day, when this fact is celebrated. Also, north of Balos, on the cape Korykos, there are the ruins of a small Roman town called Agnion, and a temple dedicated to Apollo. Today there is the picturesque chapel of Agios Sostis. Also, north of Balos, on the cape Korykos, there are the ruins of a small Roman town called Agnion, and a temple dedicated to Apollo. Today there is the picturesque chapel of Agios Sostis. 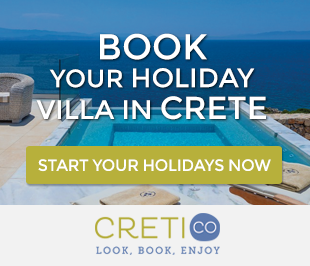 If you are planning to visit Balos, one of the best beaches in Crete, it would be better for you to find a villa in Kissamos area. This location gives you the chance to visit a number of famous beaches and visit placed that only in your imagination existed! Posted on 15 Apr 2015 in Chania and tagged Balos Beach, Best Beaches In Crete, Exotic Destinations In Crete, Kedrodasos, One Day Trips In Crete.